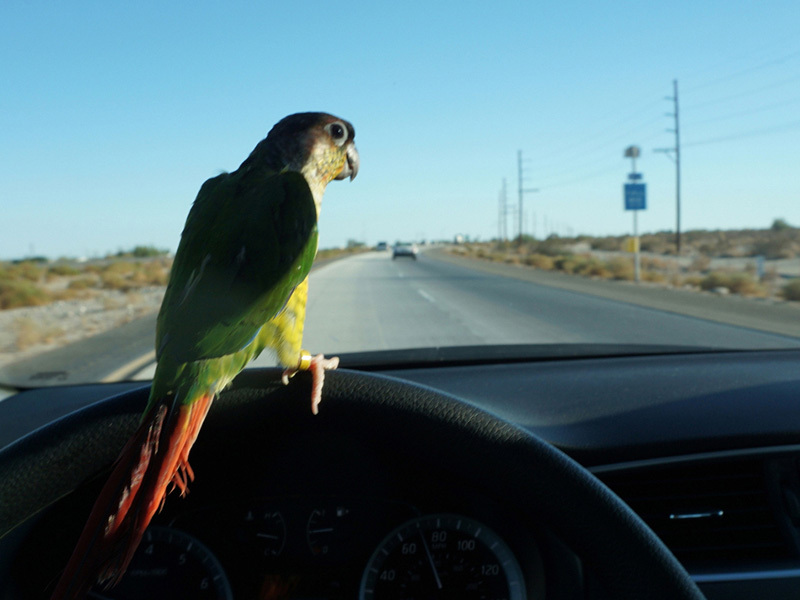 In november 2014 i filmed a bird driving to the salton sea in california. For this work the artist went to a petshop and bought the ‘loneliest’ bird he could find, taking him on a roadtrip to the Salton Sea in California. Located in the state’s Southern desert region, the Salton Sea has the most diverse and probably the most significant populations of bird life in the continental United States. It is also an important migration route for birds and accordingly has been designated as a wildlife refuge. On the roadtrip, the artist found that the bird was surprisingly comfortable being around humans, and in particular to hearing human voices. By reacting to the voice navigation system throughout the journey and even riding on the steering wheel, the bird was perhaps harking back perhaps to a repressed instinct for navigation. Yet this instinct is one that at every stage has been mediated through human interaction, and upon reaching the Salton Sea, the bird didn’t want to leave the artist’s side.